When I was a teenager, my mother had a best friend who intrigued me no end. At that age, I was perpetually looking for clues to this whole thing called ‘Woman’, traits and ticks I should aspire to or imitate, and there was something about this woman that told me she might have a few answers. She was the physical opposite of my mother in many ways, tall and Junoesque where my mother was petite, darkly exotic with Spanish gypsy looks to match, danced flamenco in her spare time, and always trailed clouds of some very heady perfumes. I can remember she wore Estée Lauder’s Cinnabar when my mother wore Shalimar and Mitsouko, and another one I recall that entered the room a good ten minutes before she even got out of her car, something exotic and nearly overpowering in its intensity, something nearly frightening to a teenaged girl. For years and years I swore it was Fracas, one of those immortal perfumes that so many seem to have an opinion about. Only fairly recently did I realize it wasn’t Fracas at all, but the original Chloé in parfum form, but even as a teenager, I recognized one very important element both perfumes had in common. Victorian mothers in the India of the Raj, so the story goes, forbade their virginal daughters to even smell tuberose, lest they get the kind of ideas that did not encompass lying back on their wedding night thinking of England. The tuberose has a heady, haunting scent unlike any other flower. It shares a few similiarities with jasmine, but unlike jasmine, it has a distinct opening blast that some people call gasoline/burnt rubber and others call mentholated mothball or bitter wintergreen, and right before you curl your lip with disdain and wrinkle your nose in disgust, it blooms into such ghostly, toe-curling, spine-chilling beauty there’s nothing you can do but surrender. Until that one day it bloomed past the rubber and the wintergreen, and kapow!, I was done in by that sucker punch of beauty…I’ve loved tuberose ever since, in perfumes such as Carnal Flower (although that has a coconut angle that sometimes turns on me), Estée Lauder Private Collection Tuberose Gardenia, or recently, the stunning Cepes and Tuberose by Aftelier. Time to grow up, time to evolve, damn it, so when I had a chance, I requested a sample of Piguet’s Fracas. Fracas is universally considered the gold standard of tuberose. Germaine Cellier, she of the elegant, green/leather chypre whip known as Bandit as well as the ultimate galbanum known as Vent Vert for Balmain, created Fracas in 1948, and just like her other two creations, it was an instant, influential hit. It has since been reformulated, like everything worth loving these days, but just as with Bandit, this version has been re-orchestrated with great care and the utmost respect for Cellier’s original classic. I was lucky enough to receive Fracas in both eau de parfum and parfum versions so I could compare the two, and braced myself for the onslaught. It had taken me this long to sum up the courage to try it. Come on…how bad could it be? Bad? What bad? What was I afraid of? What on Planet Earth was all this fuss about? Why is Fracas considered such a love/hate prospect? The fact is, if you hate big, blousy florals, Fracas won’t change your mind. If the idea of a breathtaking bouquet of Loud, Proud, Grand, Glorious Blooms strikes terror in your heart, Fracas might induce nightmares of femme-eating flowers straight out of a blood-curdling Roger Corman movie. Say it doesn’t, that you like your big, blousy florals, say you even like tuberose. Say you’re a cynic, as I usually do, and few things surprise you. Fracas…did. Because it is…beauty in a bottle. From the green opening to the opulent, white-floral heart all the way to a mossy, sweet drydown, Fracas is nothing less than breathtaking, nothing less than a flawless, stunning perfume that puts the tuberose front and center beneath a Klieg light on a red-carpet moment, while her ladies-in-waiting – and such ladies they are, too – sink to their feet around her in an admiring swoon that never detracts from the main attraction – Her Empress of Tuberose in all her heady, outrageous splendor. Since they are all present and accounted for, the supporting players that read like a Who’s Who of heart notes ensure that Fracas never becomes too one-dimensional and keep it complex and intriguing, never too sweet or too much. Having said that, wear wisely. This stuff is built to last, proof they don’t make them quite like this any more. Make no mistake. Fracas, I came to discover, is a man-eater. Apart from one man I know who doesn’t much care for florals at all, this stuff is devastating on practically everyone else. It will put the va-va in your voom, it will bring grown men to their knees, it will make indelible impressions. As it does, you will walk a lot taller, a lot sexier, you might even convince yourself to wear heels and stockings, silk slip and a garter belt to match. 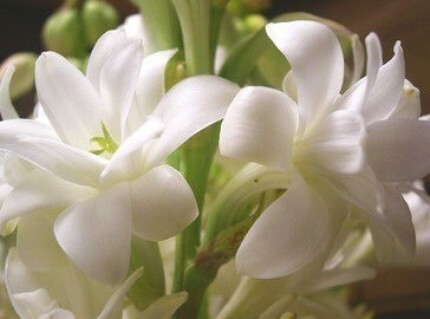 That White Jade Empress called…tuberose. Robert Piguet Fracas is available in many locations, and can often be found at online discounters without breaking the bank, unless you buy it in parfum. A big hug and thank you to Suzanne of Perfume Journal, who gave me the chance to try it in both versions. Starting today, Scent Less Sensibilities is taking a badly needed break for a few days, as yours truly indulges her Inner Rock Chick and predilection for a Primeval Force from New Jersey. I shall return over the weekend, and that’s a promise! Stay tuned for grab-bag mini reviews, another spotlight on another amazing Indie perfumer, and yet more fragrant wonders to come! Posted on July 6, 2011 October 29, 2011 by Tarleisio	This entry was posted in Uncategorized and tagged Carnal Flower, Estee Lauder Private Collection Tuberose Gardenia, Fracas, Robert Piguet, Tubereuse Criminelle, Tuberose. Bookmark the permalink. LOVE, love, love your tribute to Fracas, the ultimate goddess perfume. Thank you, gorgeous one, for writing her up so beautifully! I wore Chloe (edt) as a teenager and I STILL wonder at my mother (who tended to share those Victorian mother's worries) letting me out of the house in it. Fracas is amazing, take-no-prisoners, full-out womanly. And yet I do not love her. There is so, SO much orange blossom in there that it blunts my tuberose love. But “Empress” is quite correct. Nobody puts Fracas in a corner – or, indeed, in anything but couture and a gilded throne. This is a beautiful review. Thank you! Have a good break. Make sure you have too much fun! Suzanne, it could never have happened without you! ANd as you know, these things have consequences! 😉 It was a surprise love – and aren't those always the best kind? Orange blossom, as you know, is one of my all-time favorite notes (blame my Florida childhood), so I have no problem with that lady in waiting. As for the 'Empress. '..yes, Fracas certainly IS. I thought it fit her perfectly! As for the vacation…I already am! If it was a beautiful review, it's because it's a beautiful perfume. Loud, proud, grand AND glorious! That Cellier was a straight-up genius. So many different moods and personae she captured. Perfumaniac – I'm so glad you liked my review! Yes, Fracas is a little…intimidating, and sometimes, that can be a good thing! As for Germaine Cellier – goodness, what an all-out genius she was! Bandit, Vent Vert, Jolie Madame, Fracas – she broke a lot of rules and a lot of ground, and influenced an enormous amount of perfumes because of it. Chloé strikes me – at least in the vintage incarnation – as another and maybe slightly more…obvious take on tuberose, or tuberose with a few rough edges that were sanded down in Fracas by all the other heart notes. I admire it hugely, but I couldn't wear it. Great review! If it weren't for my hate of tuberose in general and Fracas perfume in particular I would have been running to order a sample. Now I just keep reminding myself that there was a good reason I gave away my sample of Fracas and that I still have accidentally bought travel bottle of Carnal Flower to work on my tuberose tolerance. Undina…tuberose is a diva, there really is no other way to describe her. Love her or loathe her, you can't get around her! Something tells me I''ve never given Carnal Flower the chance it deserves, and I know it's considered a modern, updated sibling of Fracas. I'm not quite sure whether it was the coconut or something else, but I really, truly do need to give it another try! You know something's dangerous when you actually have to work at appreciating it!